The predecessor of the Multnomah County Library in Portland, Oregon was the Portland Library Association which was established in 1864. Originally, the Portland Library Association was a subscription library, but in 1902 it became a free public library serving all of Multnomah County. Bookmobile service was one of the strategies used to extend library service to the county. I recently acquired the postcard above showing one of the Library Association's early bookmobiles. 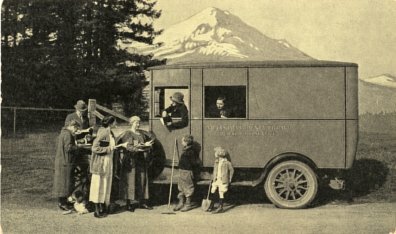 The caption on the back reads: "The Graham Brothers Truck has been in service at Portland, Oregon, for over eighteen months and has exceeded the fondest expectations of the Library Association in increasing the number of rural readers. The inside of the body carries approximately 600 books." This bookmobile dates from the early 1920s. There is another view of the Graham Brothers bookmobile on the Multnomah County Library's Flickr site. There are also many other views of bookmobile service on the Library's Flickr site. The Multnomah County Library no longer provides bookmobile service.